MOUNT GILEAD — They are both seniors at Northmor High School and belong to the same 4-H club and now they are the 2017 Morrow County Junior Fair King and Queen. Chosen Tuesday night during the ceremonies were Becca Duckworth as queen and Manny Heilman as king. First runner-up to the king is Jacob Serio. First runner-up to the queen is Marissa Hall; second runner-up, Kayla Barker; third runner-up, Alyssa Thompson and fourth runner-up, Andrea Oldham. Duckworth, attired in an off the shoulder flora print hi-lo dress and holding her queen’s bouquet, said she was “shocked but happy” when they announced her as the 2017 queen. She plans to major in Agricultural Education at ATI Wooster. Heilman said, “I was surprised and honored.” He is showing market goats, eight poultry projects, one turkey, ducks, quail and rabbits at the fair. During the next year he plans to visit 68 Ohio fairs and break the record for the number attended. Heilman plans to study political science and get involved in local government. 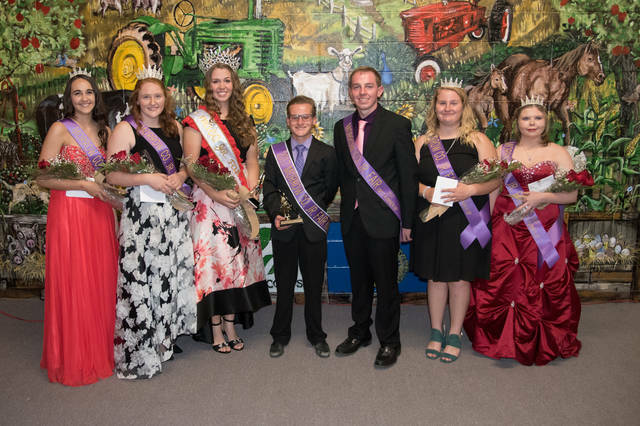 The new king and queen, both members of the Johnsville Jolly Farmers and Farmerettes, were crowned by the 2016 king and queen, Adam Barrett and Miranda Harvey. Both thanked their parents and friends for support the past year. The annual Royalty Dinner was served prior to the coronation ceremony. Ambassadors from around the state and the local fair were recognized during the program. Also recognized was artist Jennie Etgen, who painted the mural on the back wall of the stage. Morrow County Fair Royalty, from left, are Kayla Barker, second runner-up; Marissa Hall, first runner-up; Becca Dunckworth, queen; Manny Heilman, king; Jacob Serio, first runner-up; Alyssa Thompson, third runner-up; Andrea Oldham, fourth runner-up. The mural behind the court was painted by Jennie Etgen. https://www.morrowcountysentinel.com/wp-content/uploads/sites/29/2017/09/web1_Fair-Royalty.jpgMorrow County Fair Royalty, from left, are Kayla Barker, second runner-up; Marissa Hall, first runner-up; Becca Dunckworth, queen; Manny Heilman, king; Jacob Serio, first runner-up; Alyssa Thompson, third runner-up; Andrea Oldham, fourth runner-up. The mural behind the court was painted by Jennie Etgen.